OHL Draft Eligible Update With the World Junior Championships over, and the NHL getting all of the excitement, let’s not forget about the junior ranks which currently contain many of the NHL’s future stars that should hear their names called at the Prudential Center in New Jersey in June. The Central Scouting Service released their Midterm Rankings this afternoon, which makes this a great time to evaluate the 2013 draft class. While normally I would somewhat project teams to draft slots, with the season beginning on Saturday that would be nearly impossible to pull off so looking at Pittsburgh’s potential this season I will be previewing late 1st rounder possibilities that could even potentially slip to Pittsburgh’s second pick. The first player to keep an eye out for is Max Domi from the London Knights of the Ontario Hockey League. Yes this is Tie Domi’s son and is currently listed at the 23rd best North American skater. Max got off to an extremely fast start and was rumored to be a possible Top 10 pick going into the season, but has since tailed off a bit and that has allowed some players to pass him by. Domi is not a single thing like his father, as he has a greater sense of scoring ability, and less of a bruising sense. His name should help a bit and he should be a late first round or early second round pick. A good finish to the season could improve his stock to put him in the late teens in the final ranking, which should allow for him to be available when the Penguins will select assuming that they stay on par or hopefully improve on the last couple year’s results. The next two players are more physical players similar to a Chris Kunitz type mold. 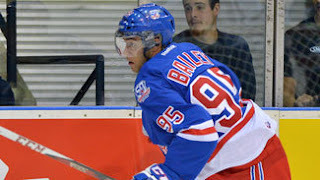 First is Justin Bailey from the Kitchener Rangers of the Ontario Hockey League. Bailey is an American product out of the Buffalo area has seen advanced progress in his skill set due to growing up in the Williamsville neighborhood usually populated with members of the Buffalo Sabres due to its higher end living, including former Penguin Matthew Barnaby, who was spotted talking with him following Kitchener’s latest trip to Erie. He comes right from the Barnaby mold as well being a force in the corners, yet also has a very sneaky scoring touch. Bailey was ranked at 37th in the midterm rankings, and could be higher if not for suffering a concussion early in the season. While the injury could leave question marks especially with all that Pens fans had to deal with concerning Sidney Crosby, that seems to be completely in the past as he looked very good in the games that I have watched him which have all been post injury. If his stock does not see a boost with the remainder of the season, I could see him sliding to the mid to late second round potentially allowing for the Penguins to draft him at a steal of a pick, however if his stock builds like I expect, the Pens may have to reach for him a little bit in the late first, or trade to the top portion of the second round to have a chance on him. The talent level is definitely worthy of the first round, however the concussion will likely drop him to the second round. Next up is Stephen Harper from the Erie Otters of the Ontario Hockey League. 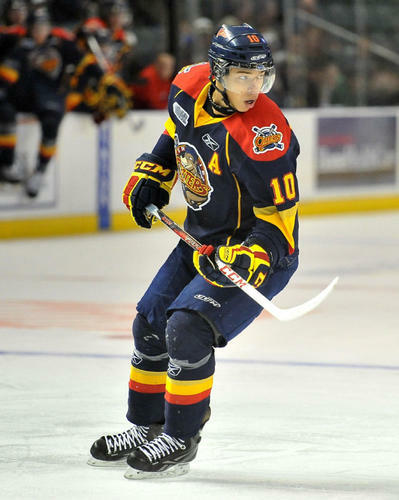 The “Prime Minister” as Erie Otters broadcaster Paul Roper likes to reference when he scores, Stephen Harper has started to create quite a buzz for himself on a team that features now 16 year old phenom Connor McDavid. Harper’s status boost can likely be credited a bit to the buzz surrounding McDavid with the additional team personnel that has descended on Erie to check out the Otters, however Harper is very much worthy of being rated at 38th for North American skaters. This is a player that I have said multiple times would be a great piece for the Pittsburgh Penguins to add, as he reminds be a lot of Chris Kunitz, but has the potential to be more like a Jarome Iginla type player. He is like Kunitz in that he is not a “regular” on the score sheet, but his leadership qualities and potential scoring abilities lead me so put a comparison to Iginla. If you get the chance, I would encourage you to watch the CHL Top Prospects game tomorrow evening, in which he will be taking part in. In the next couple weeks there will be some higher end goaltending prospects that I will be watching, and then bringing some more insight to you on them, as well as updates on Penguins Prospects currently in the OHL.